I can't create an account - says my email is already in use? What's the smallest number of live crickets I can buy? What's the best size live crickets to buy? How many live crickets will my animal eat? Do live crickets ship with food in the box? What's the best type of container to keep live crickets in? How big should the container be? What's the best temperature for live crickets? How do I feed and water my live crickets? How long will my crickets live? Can I use insecticides around live crickets? Do you carry other insects (mealworms, superworms, etc)? How does the nutritional value of various feeder insects compare? What are the ingredients and nutritional analysis of Ghann's Cricket Chow? Do you carry other reptile related products? Why do I not see an item in your web store that I thought you sold? How do I use a Ghann's Gift Certificate? I can't create a new account - new site says email already in use! When trying to place an order or create an account, if you get a message that your email is already in use for another account, it may be that you previously placed an order as a GUEST on our website using the same email address (the site has your email address linked to a "temporary guest account"). Click the Forgot Username or Password link below the Sign In button, and follow the instructions to set a new password. This will transform your Guest account into a Registered account. Now you should be able to login using your email address and new password. You can EASILY compare shipping costs for various methods. Add the desired items to your shopping cart, hit the Checkout button, select Checkout as a Guest (if you haven't created an account), and on the first page of the checkout process you'll see a Shipping Estimate section towards the bottom right. Just choose your State and enter your Zip Code to see available shipping options and prices. The smallest number of crickets we offer is 250 crickets. See our Live Crickets store for pricing. As a general guideline for sizing your pets meal, the insect should be about 1/2 of the width of your pets head, (or equal to the distance between the animal's eyes), but most herps can actually eat a cricket a little larger than you'd think. The 5/8" crickets are probably our biggest seller, with 1/2" coming in a close second, (then 1/4", and then 3/4"). The really small sizes (1/8", 1/16", and pinheads) are great for baby chameleons, beardies, geckos, tarantulas, etc. As you might imagine, this will vary greatly depending on exactly what type of animal it is and how old (or large) it is. GENERALLY SPEAKING (and this is VERY general), a small lizard or frog may eat only 3 or 4 appropriately sized live crickets once or twice daily (see "What's the best size" FAQ topic for size suggestions), a medium sized lizard or frog may eat 6 or 8 live crickets once or twice a day, and a large lizard or frog may eat 8 or 10 live crickets once or twice a day. To stretch your feeding dollars, we recommend buying at least a week's supply at a time. If your animal can take smaller crickets (1/2" or smaller), you can usually get away with buying 2 or 3 weeks' supply at a time (the smaller ones will live longer than larger ones). Animals can always eat crickets that are a little too SMALL - they'll just eat more of them - but they may NOT be able to eat crickets that are too LARGE. Yes and no. Crickets LARGER than 1/2"... YES. We put several pieces of potato in the box to provide nourishment while in transit. We recommend replacing the potato with a more nutritious food source like one of our special cricket diets once you've transferred your crickets into an appropriate holding container (like our Exo Terra Cricket Pen). Crickets 1/2" and SMALLER... NO. We do not put any potato in the shipping boxes because smaller crickets are more easily injured or killed by the pieces of potato bouncing around in transit. The plastic tote boxes readily available at most home improvement stores work great. If you want something smaller, check out our Exo Terra Cricket Pen - it's perfect for 500 1/2" crickets (can hold more if the crickets are smaller). Glass aquariums are OK... but not the best choice. Glass is a poor conductor of heat which means it tends to stay cool to the touch. This can make it difficult to maintain the proper temperature for the crickets, ESPECIALLY for crickets 1/4" & smaller. Expect a higher death rate when crickets are kept in a glass tank. Your box should be sized to provide adequate space for your crickets to spread out comfortably. They do not like to be too crowded. Overcrowding is the # 2 cause of excessive death rate in crickets. (The # 1 cause is buying poor quality crickets from one of our competitors!). As long as the crickets don't have to stay stacked on top of each other they will be fine. Each cricket needs to be able to stand directly on some surface other than another cricket! The packing materials from our shipping boxes (egg flats) stood up along the inside walls of your holding box will provide excellent crawling & hiding space. If your box is short enough that the flats come too close to the top (within 3 or 4 inches) just tear them in half. You can also rough up the inside walls of the holding box with sandpaper to provide more crawling space (this also provides an easy way for you to collect the crickets by scraping them off the walls with one of our Live Cricket Counters!). 80º F is a good all around temperature for live crickets. However, if you are able to keep different sizes at different temperatures it can help them live longer. Generally, smaller crickets do better at warmer temperatures. Pinheads do best at about 85º to 90º F, 1/2" - 3/4" crickets will do fine from 80º to 85º F, and adults will keep best at 75º to 80º F. But again, you should find that they all do OK at 80º F.
Live crickets do best when fed a diet similar to what they were raised on. We now offer our exclusive Ghann's Cricket Chow formula developed by our founder, Aubrey S. Ghann many years ago, and also a High Calcium Chow based on the same formula. We have tried many "modern" formulas over the years, but have yet to come across any that grows crickets as strong and healthy as our original formula. Feed "free choice" (keep some chow in plate at all times & let crickets eat as they desire). Be sure they can get to the food easily! If you don't see crickets actively on the food source, maybe they can't reach it. If necessary provide some type of "ladder" for them to climb up to the food - wrap a piece of paper towel around outside bottom of plate or food tray so they can climb up to the food easily. It's also not a bad idea to supplement your crickets' grain diet with some fruit occasionally. A quarter of an orange or apple every few days is just the trick. Water should also be available to live crickets at all times! One of our watering kits works great (be sure to wash (with dish washing soap) and thoroughly rinse all parts of the kit before initial use, and about twice a week thereafter. Be sure crickets can get to the water (remember the paper towel around the base trick?). Be sure the sponge completely fills the trough & leaves no standing water - crickets will get caught in it & can easily drown (they aren't very smart!). The short answeris... it depends. Many factors come into play here. First and foremost is the quality of the crickets (yes, there can be a BIG difference from one producer to the next). Second is the age of the crickets when you get them (larger crickets are nearer the end of their natural life cycle). Temperature, nutrition, and cleanliness of the holding environment are also big factors. The complete life cycle of a live cricket is approximately 8 to 10 weeks under ideal conditions. This does NOT mean that all crickets will live that long. Crickets experience some degree of physical stress during the production, loading and shipping processes, which does shorten their life expectancy. The amount of stress depends upon the care taken to produce, package and transport them. At Ghann's we "baby our bugs!" which is one of the reasons Ghann's crickets are so hearty. The species we are now primarily shipping (Gryllodes sigillatus, aka "Banded Crickets") are approximately 5 weeks old when they become adults, and are about 3/4" in length. Banded crickets are quite hardy (more so than other species) and If cared for properly as outlined above, 3/4" Bandeds should live about two weeks after you receive them (maybe longer). 5/8" are slightly younger than 3/4", and should live for about three weeks. 1/2" crickets are a slightly younger than 3/4", and should live about a full week longer than 5/8", and so on down through the sizes. Note: This life expectancy information is just a guideline and is NOT a guarantee. The conditions mentioned above will have a GREAT deal of influence on how long your crickets live. Can I use insecticides around my crickets? NO! Avoid any type of insecticides - sprays, "no-pest strips", anything that might give off fumes, even if not in the same room. Live crickets are very susceptible to insecticides! Normal shipping days are Monday through Thursday (no shipping on Fridays) so packages will be delivered before the weekend. For more detailed info see Shipping Info page. Do you carry other insects (mealworms, etc)? YES. Check our Worms page for current offerings. Check our this chart - Nutritional Value of Popular Feeder Insects. Our founder Aubrey S. Ghann spent several years developing a feed formula that produced healthy, hearty, lively crickets, and we still use his formula today. This is what we grow 'em on! Ground yellow corn, calcium carbonate, soybean meal, wheat middlings, ground soybean hulls, meat meal, fish meal, animal fat preserved with BHA, dicalcium phosphate, salt, DL-methionine, cyanocobalamin (source of vitamin B-12), riboflavin, calcium pantothenate, nicotinic acid, choline chloride, folic acid, sodium selenite, pyridoxine hydrochloride, vitaminA acetate, cholecalciferol (source of vitamin D-3), di-alphatocopherol acetate (source of vitamin E), menadionedimethylpyrimidinol bisulfite (source of vitamin K), magnesium oxide, thiamin, cobalt carbonate, ferrous carbonate, copper sulfate, calcium iodate, manganous oxide, zinc sulfate, zinc oxide. Yes! 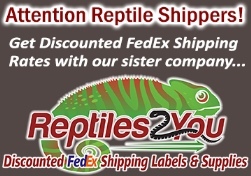 Check our Reptiles Supplies section for current offerings. And if there are things we don't have that you'd like to see us add, please email us with your thoughts. We may occasionally sell out of certain items, and when that happens we temporarily remove them from our online store. The item will reappear as soon as we have it back in stock, so please check back often! YES! We occasionally offer coupons on our Facebook page, via our Twitter feed, and via promotional emails. If you have purchased from our website before, the email address you used to purchase is already on our list (unless you UNchecked the "Specials and Discounts Email List" box on the Billing Address page of the checkout process). 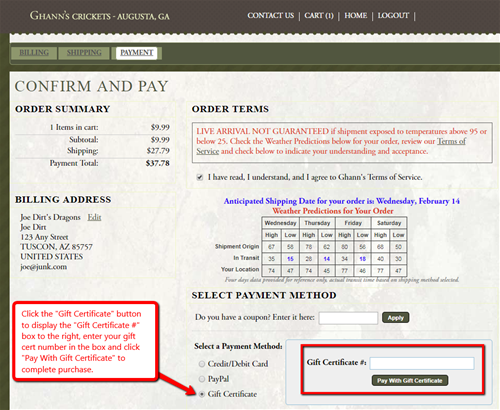 On the final page of the checkout process, in the "Select a Payment Method" section, click the "Gift Certificate" radio button to display a box where you type in your Gift Cert number (screenshot). No, we don't. Our web site is the best place to find the latest information and special pricing on all our products and services. Have a question that isn't addressed here? Email us - we'll do our best to answer promptly, and if your question is good we'll add it to this page.